The Gulf of Maine Council’s Web site is chock-full of educational resources on the marine environment. Find maps, photos and information about marine habitats, seafloor mapping activities, salt marsh restorations, environmental indicators and more. Check out a database with 600 NGOs working in the Gulf of Maine ecosystem, grant announcements, current research and links to other Gulf of Maine resources. The Gulf of Maine Research Institute (GMRI) uses innovative computing and communications technologies to teach and learn about aquatic environments. Topics range from how satellites image the Earth to detailed examinations of species and habitats including lobsters, turtles, herring, marine mammals and aquatic environments. Working with the National Aeronautics and Space Administration since 1994, GMRI’s Web site describes global climate change, hurricanes, the Tropical Rainfall Measuring Mission, and over a hundred classroom-tested activities. Current Web-based NASA projects include online Earth-science recertification courses for teachers and outreach for a three-year project that is investigating how marine organisms construct shells out of molecular-scale building blocks of calcium and silica. The Society for Conservation Biology’s Web Site provides information and resources for conservation education. Among the tools is a PDF formatted article called “Principles of Conservation Biology: Recommended Guidelines for Conservation Literacy from the Education Committee of the Society for Conservation Biology.” The article describes the body of knowledge viewed by the society as the hallmark of conservation literacy. In addition, the December 2005 issue of the society’s magazine Conservation Biology features a Special Section on marine conservation. The Canadian Environmental Literacy Project offers open-access curriculum materials in support of teaching environmental studies in universities, colleges and high schools in Canada. The focus is on materials that address Canadian issues within local, regional or international contexts. The project provides teaching modules, for example, to help students develop skills in interpreting ecological field data and become familiar with scientific methods of interpreting the environment. Avian Conservation and Ecology (ACE) is an electronic scientific journal, sponsored by the Society of Canadian Ornithologists and Bird Studies Canada. It publishes papers that are scientifically relevant to the bird conservation community focusing on the conservation, ecology and status of birds. It complements other publications, such as traditional ornithological journals, conservation publications, general ecology journals and those focused on specific groups of birds. Although ACE is intended in part to enhance the international profile of Canadian ornithology and applied avian science, contributions are welcomed from all over the world. “NOAA Ocean Explorer,” a National Oceanic and Atmospheric Administration Web site features maps, satellite imagery, a selection of audio recordings captured beneath the ocean’s surface, technology used in expeditions, an ocean series curriculum, lesson plans, featured slide shows on marine life, a recent exhibit on ancient coral gardens, a history of ocean exploration and shipwrecks and more. Seafood Watch regional guides, sponsored by the Monterey Bay Aquarium, contain the latest information on sustainable seafood choices available for different regions of the U.S. "Best Choices" are abundant, well managed and fished or farmed in environmentally friendly ways. Seafood to "Avoid" are overfished and/or fished or farmed in ways that harm other marine life or the environment. You can view the guides online or download a pocket-size version. The Earth & Sky Radio Series features interviews with scientists about a range of natural science issues. The small, non-profit organization is “committed to describing humanity's work to understand itself and its relationship to the Earth.” The series is broadcasted by more than 1,000 commercial and public radio affiliates in the United States and Canada, on the Sirius and XM Satellite Radio networks. Free podcasts of the shows are also available. 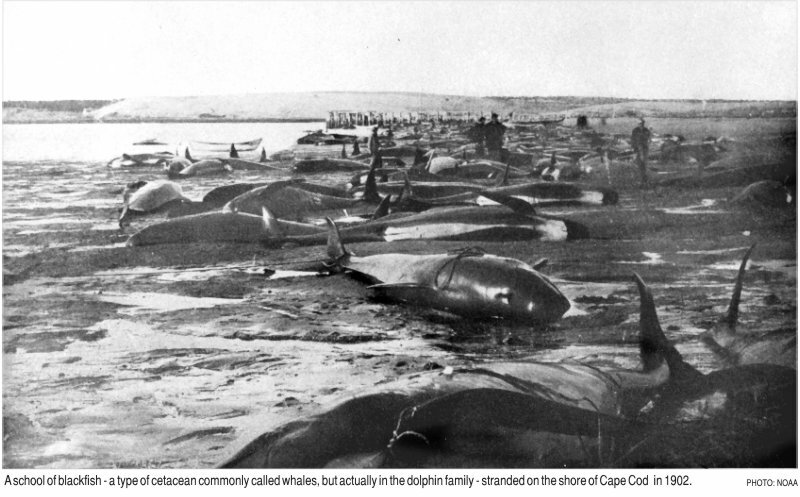 Darlene Ketten, a senior scientist at the Woods Hole Oceanographic Institution who has studied whales and dolphins strandings on the Massachusetts coast, was recently featured in Earth & Sky's radio report on why whales beach themselves (program # 4,775).